Calling all husbands! We wives, LOVE it when you plan date night, but between work, kids, and everything in between, we know it can be a little daunting. And as much as we all love the classic dinner and a movie, it’s fun to mix things up now and then, right? Right! Get ready to kick any date night dreariness to the curb because we’ve got an idea that takes out the guesswork and helps you plan the perfect date for you and your sweetheart. Best part of all, it’s quick, easy, and totally man-approved. What could be better than that?! 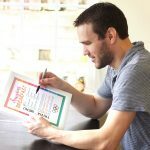 Before we begin, we have to give a GIANT shout out to Carisa from Messes to Memories for creating these one-of-a-kind printables that are bold, bright, and absolutely perfect! Thanks again, Carisa! Alrighty guys, you ready to go from “What should we do?” to “Happy Date Night, Honey!”?? Let’s get to the goods. 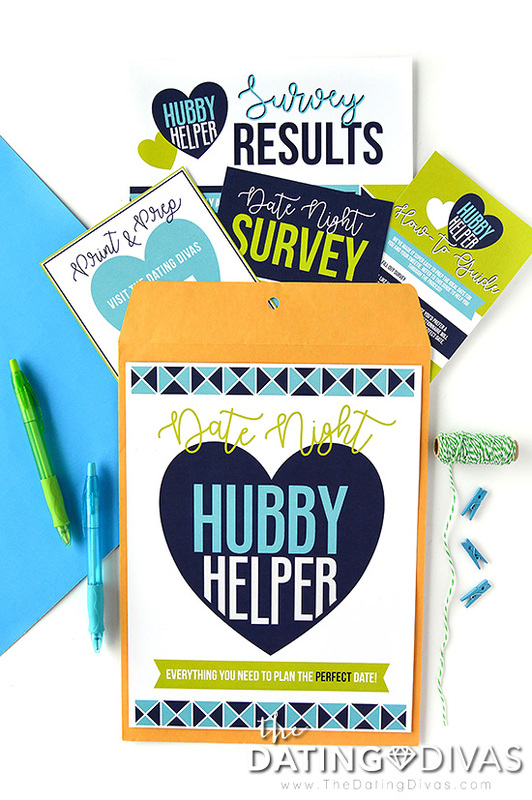 Presenting the one and only Date Night Hubby Helper: a complete go-to kit made especially for you! It’s contents are packed with goodness and totally user-friendly, plus everything fits perfectly in a large manila envelope for safe keeping. 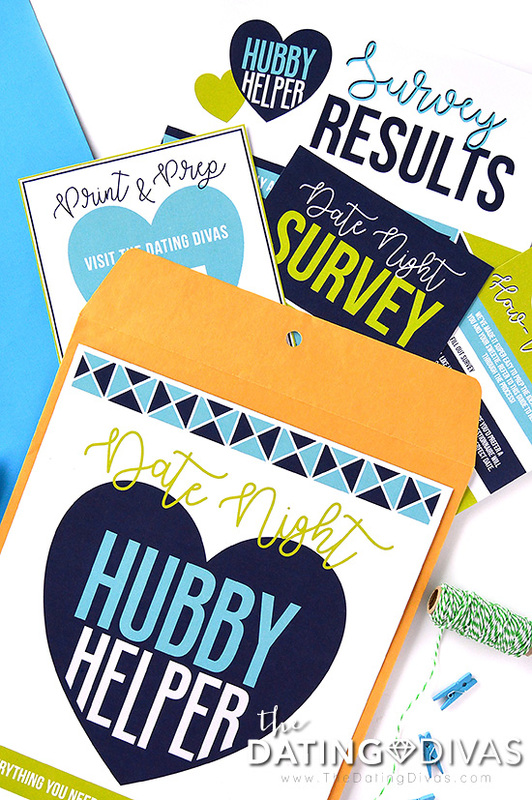 Simply whip it on out whenever you need a little date night direction and you can also pin this post so you’ve got the ideas saved in an easy-to-find digital location! 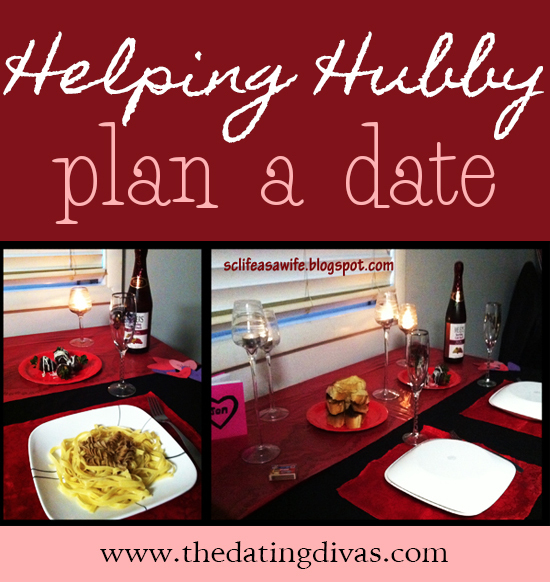 First up: the Date Night Hubby Helper How-To Guide! 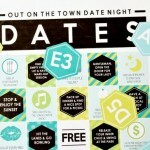 This handy dandy card of awesome does a fantastic job of leading you to your perfect date. Each step is quick, simple and a whole lot of fun! Give it a read and keep it close during the planning process, referring to it as often as needed OR feel free to come back here for a step-by-step explanation. 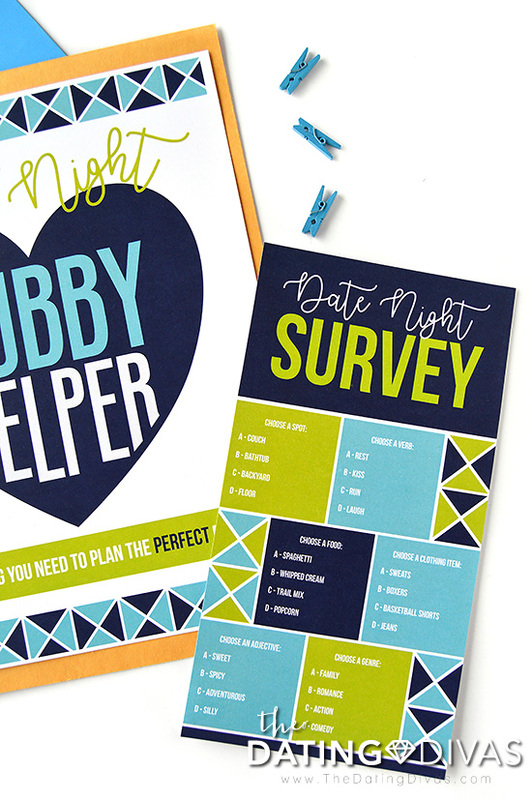 Complete your Date Night Survey. 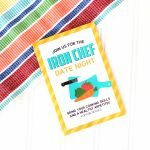 This special color-blocked card contains a quick and easy quiz that will lead you to the perfect type of date for you (and her!). Simply select which word or item speaks to you the most for each question, and you’re ready for the results! Check the Results on your Survey Results Page. Now that your quiz is complete, you’ll want to use this page to determine which type of date is best. But that’s not all. This page also includes four different date options per category so you’re armed and ready with some fabulous choices the two of you will LOVE! 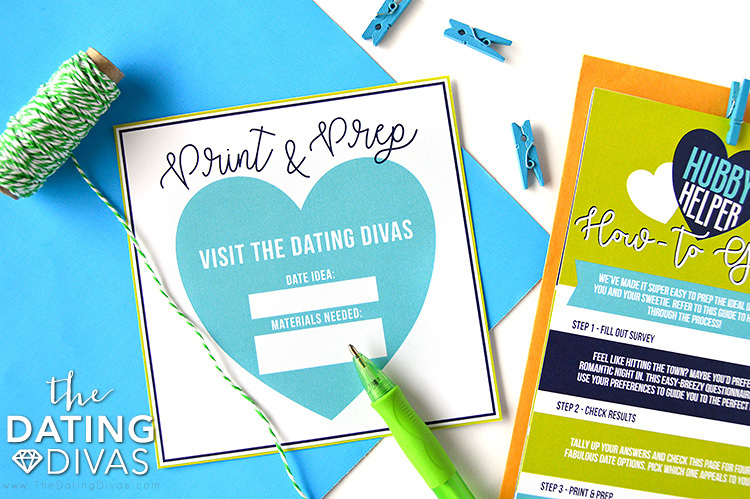 Explore your different date night options and select one using the Print & Prep Card. 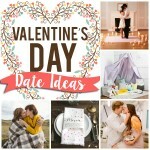 Visit www.thedatingdivas.com to explore each of your four suggested dates a little further. Select the one that gets you the most excited and fill in the information on your Print & Prep Card. 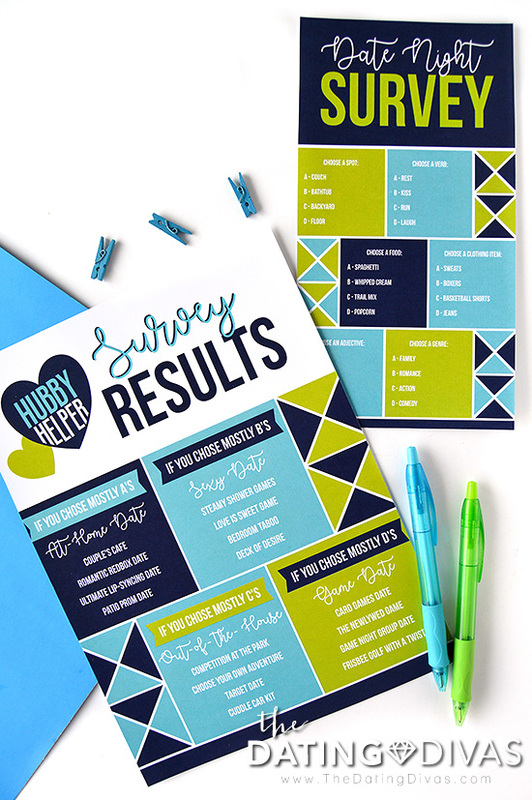 All of the included date ideas have corresponding printable invitations, activities, and instructions that will make planning and prepping an absolute breeze (plus, you can always come back here to check things out, especially if you save your favorite ideas like this to Pinterest)! Invite your wife and get ready to party! Using the corresponding printable invitation for the date of your choosing, fill out the necessary info (date, time, etc.) and leave it somewhere your sweetie is sure to find it. That’s it! You’re ready for a one-of-a-kind date night that’s packed with fun and romance. Plus the extra planning on your part will make her feel all sorts of special—an absolute win. PS. A special note to any ladies who may be reading: help your hubby out by printing, assembling, and slipping him this fantastic idea! Then go take a bubble bath because he’s got it covered. 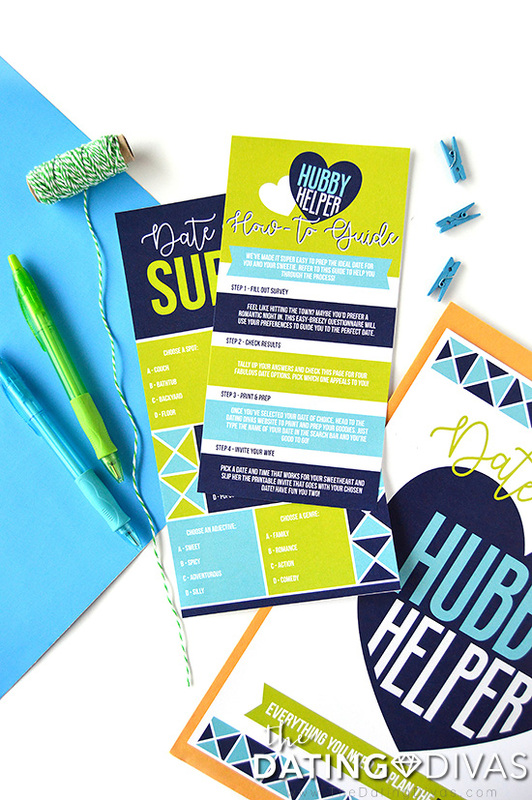 The inspiration for this post and printables comes from Stephanie from SC Life as a Wife! Be sure and check out her original post below. It’s simply too cute to not include and is full of fabulous ideas that are similar to those above but with a bit of a twist. Thanks again, Stephanie! 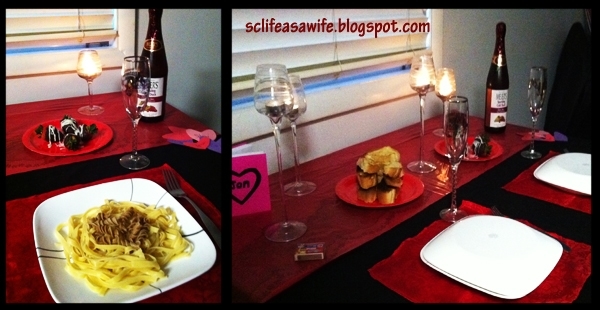 It’s me again, from sclifeasawife.blogspot.com It is always an honor to guest blog for The Dating Divas. February 14th was coming and my husband was busy, busy with school, work, and applying to grad school. Was it really fair for me to remind him that it was his year to plan Valentine’s Day? So I thought I would help him out and this is a great idea to get husbands involved in the planning. Every day I texted him a question, “Do you like it hard or soft?”, “Do you like it hot or cold?”, “Do you like it fast or slow?”, “Do you like it wet or dry?” and so on … and every day he picked one or the other, which in the end, ended up planning our date. It was a lot of fun! He loved the suspense…. and I loved that he was planning our romantic date! For even more fantastic ideas, you'll definitely want to check out our exclusive Marriage Club Gift Certificates and our Chocolate Tasting Date Night! I LOVE this idea!!! My husband… he will totally love this. The only thing is… he doesn’t have a cell phone so I will have to come up with another fun creative way to ask him those questions. I am thinking that each day I will ask the question on the bathroom mirror and have him circle his answer with my lipstick. Thanks so much! Thanks for the great idea! My hubby is a pilot and always traveling. This will be a great way to get him excited! I didn’t tell him so it would be a surprise. But the next week we went on another date and did all the opposites! Both dates were way fun! Love that this is for our hubbyies, but it really could work for anyone! So fun! It ABSOLUTELY could!! 😀 Xoxo! I love the date night survey! Genius! This is awesome!!! “Go take a bubble bath because he’s got it covered.” hahaha yes!!! Thanks, Gabby! 😀 Haha great huh?? Xoxo! Haha I LOVE this! My hubby just got super busy at work and this is perfect! Yayy! This really should work GREAT for you guys! 😀 Hope you love it! 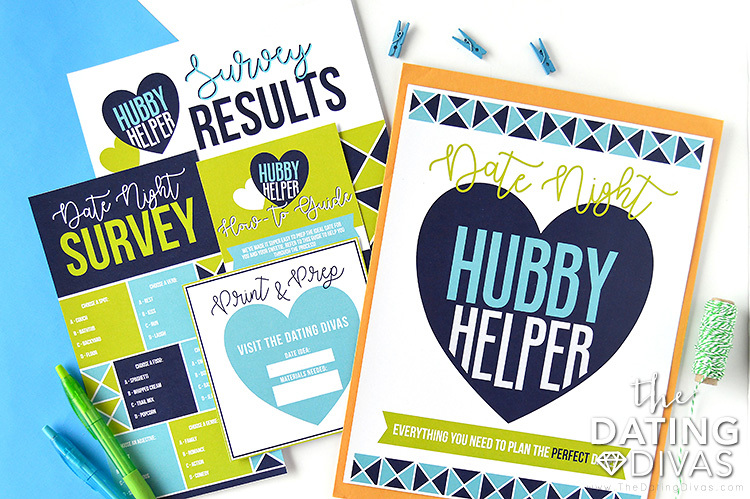 Darling printables and SUCH a genius idea! Haha – I feel like my hubby would give me lots of *bonus points* for just pointing him in the right direction. Love this! DYING over these fun printables!!!! So cute! I know when I get excited about something my hubby does too! I think this would totally help get him on board for date night!